Welcome back to the Petbucket blog’s discussion of pet obsessions. Last time we cited some statistics and anecdotes about the rising trends of pet obsessions. Today, we’ll be going forward with the conversation, and discussing the point at which pets go from being beloved companions to dangerous fixations. Preferring the company of a pet to that of a loved one, family member, or a close friend. Spoiling a pet to the point where it’s behaving in a destructive or inhospitable manner. Feeding the pet unhealthy foods because they "like it." An inability to recognize when an owner’s behavior is causing discomfort for a pet or surrounding humans. If owning a pet is alienating someone from the community around them, then they’re missing the point of pet ownership. Often people will feel that their pets are an acceptable alternative to regular social interaction, and truthfully it can be very thereputic. However, when the only source of affection in a perosn's life is coming from an animal, it’s simply not psychologically healthy behavior. In certain cases, a simple case of obsession can lead to much more extreme conduct. This terrible and debilitating psychological disorder can have drastic consequences for the health of pet owners and the pets. Worst of all, the victims of this disease don’t realize that they’re doing anything wrong. They simply can’t recognize their own inability to care for all of the animals that they are keeping in captivity. Gross cases of animal hoarding have been recorded where hundreds of cats or dogs have been confined in a single household with a very finite and enclosed space. Often animal hoarding is accompanied by symptoms of general Hoarding, in which people cannot bear to throw out any of their trash. So imagine if you will, a single split level home, with 89 cats living in it, entire rooms dedicated to rotting produce, and not a litter box in sight. Not exactly a pretty picture. Unfortunately, when dealing with a psychological fixation of any kind, the only thing that will help is psychiatric assistance. This can be both costly and ineffective, which is not the best combination. Results with therapy for obsessions can vary quite wildly. 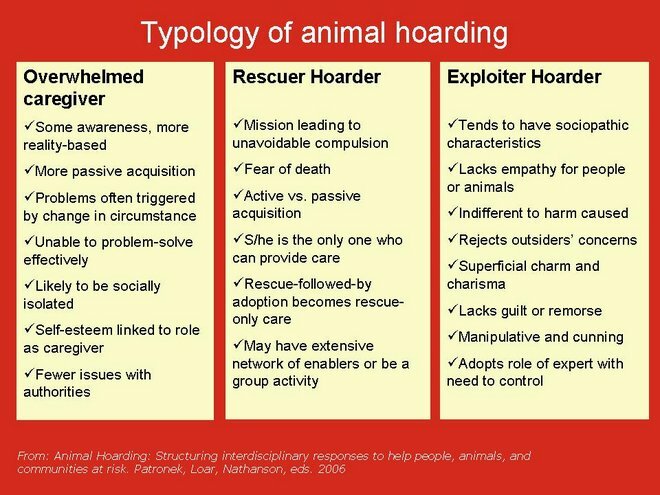 And in the case of Animal Hoarding, the behavior is very likely linked to some deep seeded psychological trauma. Animal hoarders, when diagnosed, are almost never completely cleared of their conditions. It’s a lifelong obsession that must be continually combatted, and cases of full recoveries are very rare indeed. If you ever notice anyone engaging in this sort of destructive behavior it’s very important that you seek to provide them with psychiatric assistance as soon as possible. You can help save dozens of animal lives, and help the person begin working toward their own recovery. And of course, if you see anyone obliviously endangering the health of their pets, you are obliged to take action. That’s all for this week’s postings. Check back more for helpful information about this and many other pet related topics.